An extraordinary and tantalizing idea of uncompromising luxury and exuberance is presented in the brand’s renowned manner of technical excellence and sublime practical quality in this truly spellbinding timepiece from Rolex which captures the fabulous spirit of the Pearlmaster line. 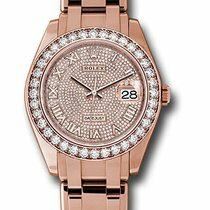 The diamond-paved dial with Roman numerals features central hours, minutes and seconds, and a date window at the three o’clock position. These functions are powered by the COSC-certified 2236 self-winding mechanical movement that offers power reserve of approximately 55 hours. The movement is safely nested in an Oyster case that is water-resistant to 100 meters. The case is made of 18K Everose gold and boasts diamond-set bezel and lugs. The watch is worn on a diamond-set Pearlmaster bracelet in 18K Everose gold, secured on the wrist with a concealed folding Crownclasp.